Our April talk will be delivered by James Mitchell, Director at Orkidstudio. The talk will be followed by a panel discussion with invited guests. THE PROBLEM: In Kenya, women are significantly disadvantaged both socially and economically with over half the female population living below the poverty line ($3.10/day) and less than 50% of girls educated at high school level. Meanwhile, Africa’s population is growing fast; by the end of this century, 40% of the global population will reside in Africa. By 2030, more than 50% of those living in Africa will reside in cities. Africa has an alarming lack of skilled designers and construction professionals, whilst existing and over-burdened infrastructure remains sub-standard for human occupation. If not properly planned for, the huge pressure that this population boom will exert on Africa’s cities will lead to a dramatic rise in public health issues, more pronounced inequalities, and increasing strains on our fragile environment and climate. OUR SOLUTION: Orkidstudio recognizes an opportunity in this problem. Innovative solutions are needed. In few other sectors is gender inequality more pronounced than in the construction industry, one of the fastest growing on the African Continent and with less than 6% women. Using our expertise and rapidly growing portfolio of award-winning design and construction projects, we work with low income earning women to provide training and employment in construction skills, enabling them to earn as they learn, significantly increasing earnings and securing a professional certification. SUMMARY: We’re working to disrupt the male-dominated construction industry - one of the fastest growing sectors in East Africa with one of the biggest skills gaps - whilst also leveraging opportunities for disadvantaged women and creating a more dignified, healthy and safe built environment. Join us today! Make Design Matter is a series of monthly inspirational talks for humanitarians. 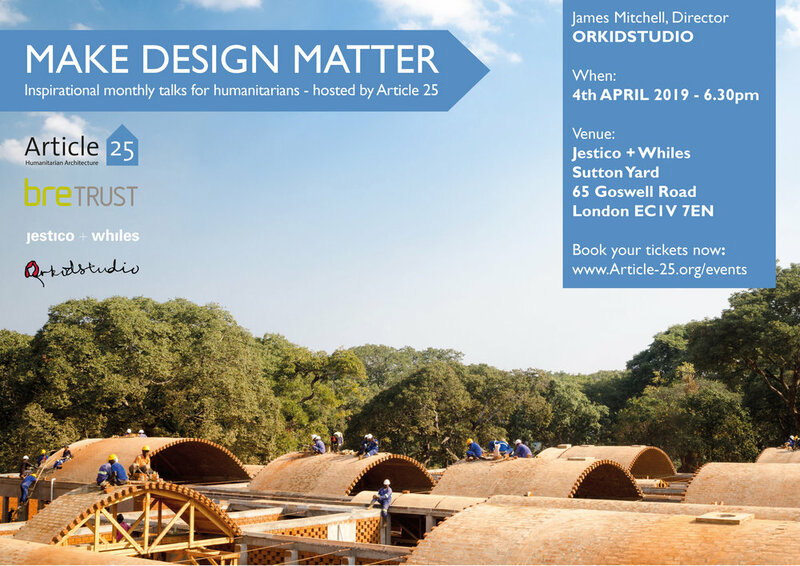 Article 25, in partnership with the BRE Trust and venue host Jestico + Whiles, are bringing together outstanding design professionals who work to support the most vulnerable in society across the developing world. These inspiring monthly panel discussions consider the pursuit of progressive, sustainable architecture which focus on the communities they serve. Meet the architects and designers at the forefront of creative and positive change in building design for international development. Article 25 is a small charity that relies on the support of built environment professionals and others to help fund our work. Please make a donation in support of our work.